The Italian Ski Instructor gave me a vehicle for sharing with you some of my favorite places. I have heard the music of cowbells while hiking far above Davos Dorf and Davos Platz. I have also experienced the awe of traveling up the Eiger on the cogwheel train and walking out on the glacier. And, yes I know firsthand how Matteo and Jennifer made the 2-minute train change in Filisur on their way to St. Moritz. I invite you to come along as Jennifer and Matteo work their way toward a future together. It’s said that opposites attract. That’s true of Matteo and Jennifer. He grew up on skis, and she loves the warm weather in San Diego. He is reserved, and she is outgoing. Although I’ve spent plenty of money sending teenage kids to the slopes, I’ve never been on skis. My research files for Matteo are voluminous, and I lost count of the skiing videos I watched. One particular aspect of skiing was especially hard to research and write. I'm not going to tell you here, but you will know it when you get to that part of the book. Matteo is not only an expert ski instructor, but also a talented furniture maker and wood carver in the off season. That meant my stacks of research files got higher. Jennifer was easier to write. I’ve often written military characters. Jennifer has not served in the military, but she is a red-white-and blue military brat whose own Naval officer husband turned out to be not such a gentleman. Jennifer stepped inside the rental shop. She was shivering from her brief trek from the lodge at Heavenly Mountain Resort. What was she thinking when she agreed to meet Brooke here for a quick girls weekend in Lake Tahoe? He watched her struggling to get out of her jacket. He stepped from behind the counter and helped her peel off layers of shirts and vests. She finally got down to a green turtle neck sweater that matched the color of her eyes. He paused a few seconds. She didn’t mind his discrete head-to-toe approving appraisal before he turned and went back behind the counter. “I need to rent everything. Boots. The works. I hope I’ll know what to do with the stuff. I just hope I haven’t forgotten everything I used to know about skiing,” she said. The tall good-looking man said, “I know more about skiing than I do about renting equipment. I’m Matteo Soldati. I’m a guest ski instructor. 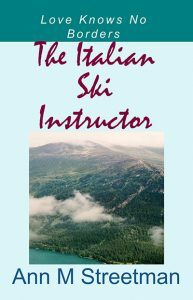 I am licensed to teach skiing in the U.S., Italy, and Switzerland.” He held his hand out across the counter. She shook it and smiled at him. Jennifer admired his rich Italian accent. She said, “I’m Jennifer Robertson from San Diego, and I know a lot more about tennis than skiing. I truly hate the cold, and I may need your help to get through this weekend. Do you give lessons to just anybody?” she asked. He laughed. “You are not ‘just anybody.’ You are Jennifer Robertson, and I would be honored to give you a lesson if my schedule permits. I have time for one or two private lessons this weekend,” he said. His reserved, but warm smile lit up his dark brown eyes. “Good. I’m feeling really unsure of myself. Can you give me a lesson early tomorrow?” Jennifer asked. Matteo checked the calendar on his smart phone. “I could do one at 7 o’clock. Nothing after then,” he said. “Absolutely, I need a total refresher. I’m really nervous about skiing again,” she said. “That’s natural, if you haven’t skied in a while and if you’ve never skied very much. Don’t worry. It will come back to you. I’ll help you,” he said. His smile and gentle tone reassured her. “In Davos, Switzerland, and sometimes in St. Moritz,” he said. Matteo shrugged. “The rich and famous may have expensive clothes and gear, but they have to work at skiing just like everyone else,” he said. “Did you grow up in Switzerland?” she asked. Jennifer studied this man. He had the grace and presence of a professional dancer and the assurance of an athlete, and his candid opinions were disarming. What an interesting, unusual person. “What about this village? Where is it,” she asked. “So you work in the Swiss Alps and you grew up in the Italian Alps. When did you become a ski instructor?” she asked. Matteo laughed. “Of course, I grew up skiing. To tell the truth, I can’t remember when I did not ski. I probably became an instructor when I was teaching my little brother to ski. I was 7 and he was 4, but I had a little help from my father. From him, I learned to be more patient with my students,” he said. “Patience is very important,” he said. Jennifer said, “I don’t know. Let me see. It must have been 10 years ago,” she said. “You will definitely need a refresher. The trails here are not for beginners. How did you happen to pick Heavenly?” he asked. “My friend Brooke picked it. We both live in California. I live in San Diego and she lives in San Francisco now. She’s a good skier. She insisted that we do a girls ski weekend to celebrate. I warned her that I might spend more time in the lodge in front of the fireplace with hot chocolate than on the slopes. It’s OK. She understands,” Jennifer said. “Ah, it’s a celebration. That’s good. What are you ladies celebrating?” Matteo asked. Jennifer frowned. “Actually, it’s not good. We are celebrating my divorce being final. The only good thing about it is that the dread is over. The waiting and wishing are over. It’s done and done.” She couldn’t believe that she had said all that to a perfect stranger. She must have lost her mind. Jennifer quickly checked his ring finger. Nothing there. It was as if he had seen her checking out his ring finger. A young man came through the front door. Jennifer watched him walk to the door. She was feeling lucky to have such an experienced ski instructor. He looked back and smiled. “Until tomorrow,” he said. She nodded. Experienced and intriguing. She wasn’t interested in getting involved with anyone. Not yet. But she wanted to get to know Matteo Soldati a little better. Just a little better. He was different and solid somehow. “Have you known him long?” Jennifer asked. Jennifer said, “Well, I guess we’d better get down to business. I need everything. All the gear, and I don’t have a clue,” Jennifer said.